I am soooo out of the loop..i thought he was a leprechaun..lol. Cool costumes. My boys wouldn't keep their masks on during trick or treating. How did yours do? Awesome costumes! Hope they had a great time! Cuties :) Hope they had a great night! 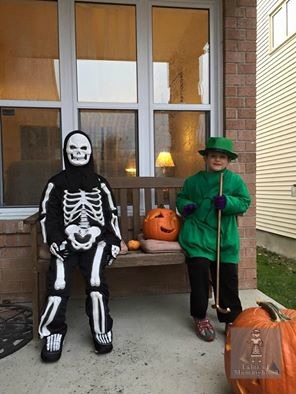 Cute costumes, did the skeleton glow in the dark?